In late October, 2012, Hurricane (later Superstorm) Sandy caused extensive damage in the North East. In New York it is very much a tale of two cities, with some areas quickly back to their stride, and other areas continuing to limp along. 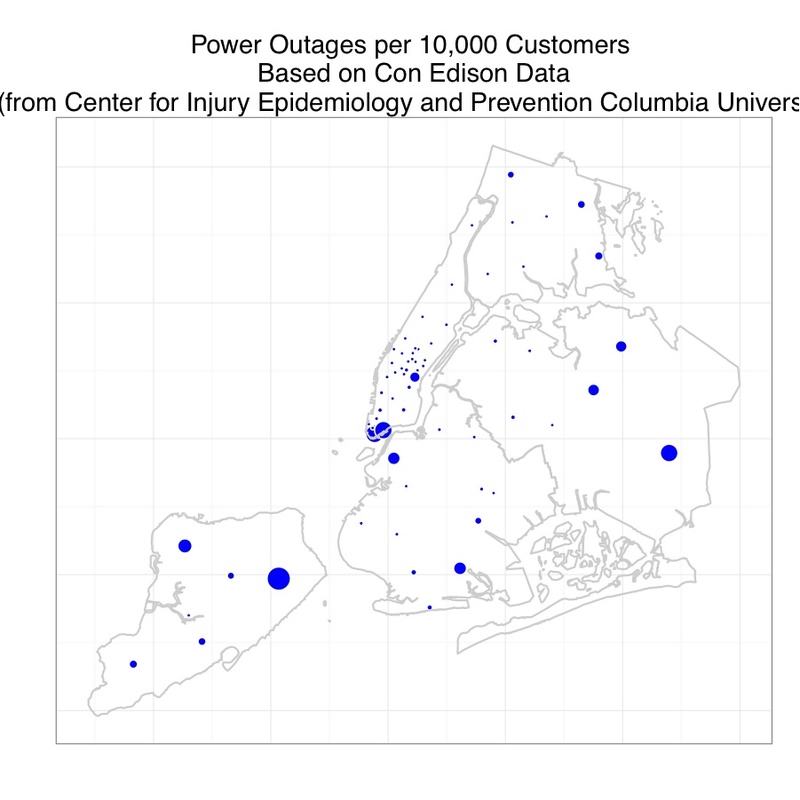 Here is some epidemiologic surveillance in the form of mapping housing damage and power outages in New York City. The following code maps FEMA surveillance data on housing damage and inundation and power outages in New York City a week after the storm touched down. The FEMA data are available via Google Crisis Maps here. The New York City borough boundary files are available from Bytes of the Big Apple The outage data files are here and here . A full write up is here . This syntax can be used for some simple plots. 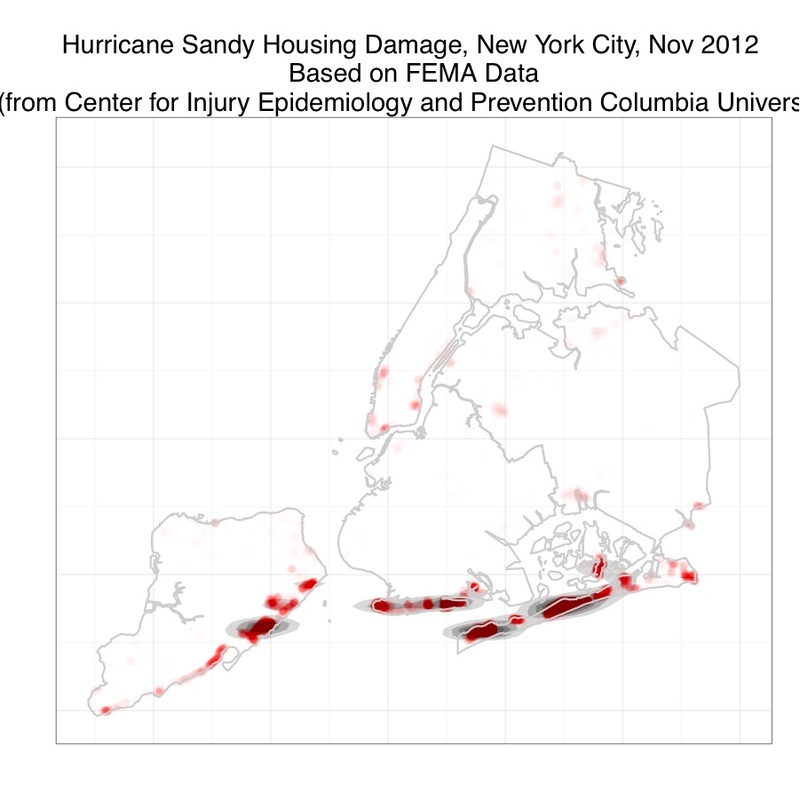 This syntax overlays (actually indexes) the FEMA data to NYC boundaries (see the vignette for an explanation). These maps are for all levels of damage. You can restrict to and explore the different levels of inundation and damage using indexing and the faceting capabilities of ggplot2. The following bits of code demonstrate how to plot the points, and then develop a density map from points. First you load ggplot2, create a spatial object restricted to NYC, and (because ggplot doesn’t play nicely with spatial objects) convert the spatial object to a data frame for plotting with ggplot2. The qplot() function can return a quick plot. The next series of code snippets builds up a density map layer by layer. First, the base map. To provide some reference, I overlay the borders of the NYC boros. First I use the fortify method to convert the shape files to a data frame for use with ggplot2. Then some cleaning up and plotting. As an alternative that may be less informative, but perhaps more intuitive to interpret, I recast the density map as with smoothed “weather map” effects. 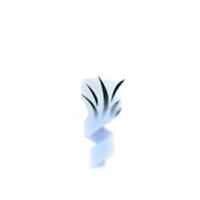 (you can find a wonderful write up on the approach here) I again build up a map layer by layer. First, I establish the base layer of points. I then add a layer of density plots. Smooth the levels of the density polygons using the alpha function. Overlay the locations of the points themselves, coloring them red, and blurring overlaid points with the alpha function. Add a title and clean up the theme elements and print. As I write this more than two weeks after the storm, with daylight hours shortening and temperatures dropping, there are still tens of thousands of people in the tri-state area (some my neighbors) without power. 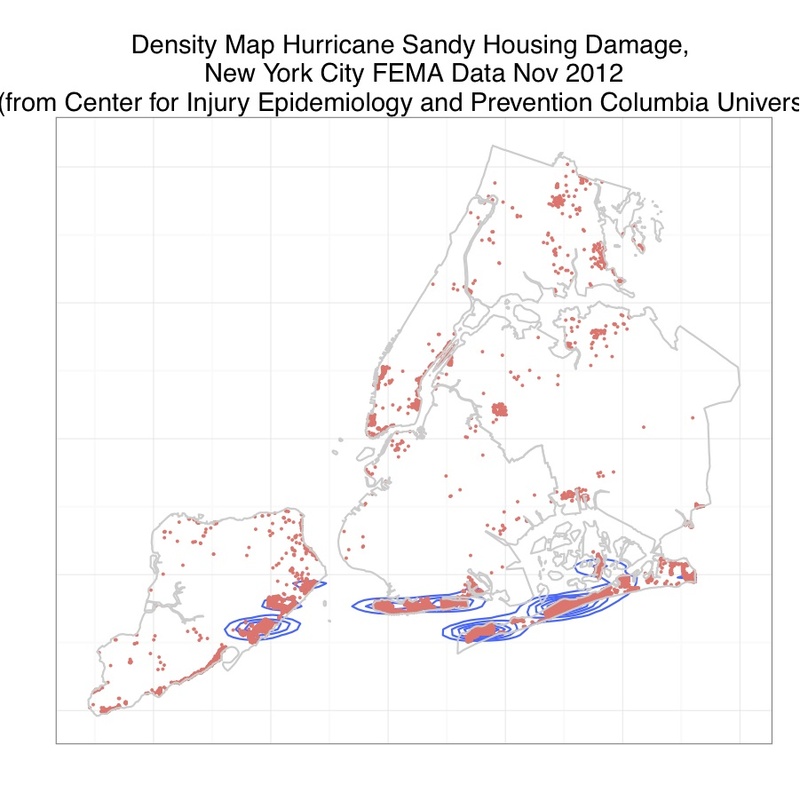 First prepare the data by reading in the csv files, merging the outage data with the centroids for the places, assigning a coordinate system and projection, restricting to New York City and converting to a data frame for plotting in ggplot2. The variable to be mapped is the proportion or percentage of customers in a location without power. Here, create the first layer mapping the coordinates to filled circles, sized by the proportion of customers without power.